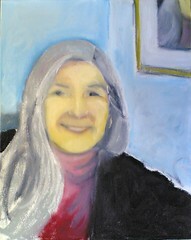 This is a self-portrait in progress, as it looked after the first painting session, which was January 29th (Tuesday). I am painting the picture on the wall, which will be the self-portrait, too, hence the title. I am working from the self-portrait photo I posted here yesterday. I took a print-out of the photo with me to the studio. I sketched the image directly on the canvas with a gray oil bar, and then began to block in the color. I was surprised at how quickly I got a general likeness, but then I have been looking at this face for lo these many years. But I am not fooled! I have done enough portraits to know that the real challenge maintaining the likeness as I continue to paint. I plan to post the results of each painting session, whether or not the work is going well. So it feels like I am working without a net here. This is my first portrait with oil bars, and a self-portrait is the best way to learn (so that if things don't go well, I am the only victim!) Early comments on this image have been that the skin is too yellow (which is because this is underpainting and I always start with yellow) and that the mouth is wrong. (Of course it is. I think it was John Singer Sargent who said that a portrait is a painting in which there is something wrong about the mouth.) So I will start with the mouth next time. 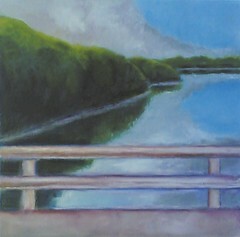 To be continued. . . .
Over the past few months, I have been painting landscapes with oil bars. Now I want to try a portrait in oil bars. I haven't done a self-portrait in a few years, and it is about time. I don't really have a good mirror at the studio, so I decided to work from a photo. But I wanted to use a photo I had taken myself. Yesterday, I was considering all this over my morning coffee, and while I was sitting on the couch, decided to try photographing myself with my phonecam. (I have done this before, usually to take a picture of myself and a friend when no one else is around to be the photographer.) So my coffee got cold while I tried to get a usable picture. It isn't easy, starting with learning to aim the camera so to avoid cutting off part of your own head. 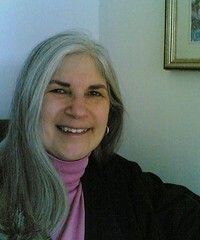 (I do have a new digital camera but I am just learning to use it, and well, my phonecam was right there. 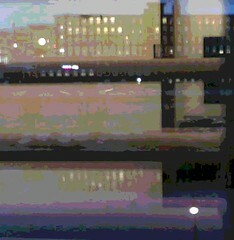 Besides, the relatively low-res images of a phonecam can be kinder, like the Doris Day soft filter in the movies.) I kept making mistakes, cutting off part of my face, squinting at the camera, and laughing at myself. So I decided to smile for the camera, because a smile is a fastest and most inexpensive face lift, and I don't want to take this so seriously. This image turned out to be the best photo, but I didn't really intend to include the framed picture behind me on the wall. But I liked the frame as part of the composition. By the time I printed this photo out to take to the studio for a reference, I had decided to use the framed picture in the painted self-portrait. But inside the frame I would paint a second (smaller) version of the self-portrait. I liked that idea for the kind of double-knot it ties in time. To be continued. . . . I decided to posterized the photo of tulips from yesterday's post, so I opened the image in Painter IX and found the level I wanted. It was fun to see these tulips in the grocery store while on the other side of the plate-glass window, the snow was piling up in the parking lot. I hope no one minds a second day of tulips in January! I decided to post this now because if I wait much longer, it won't be January anymore. 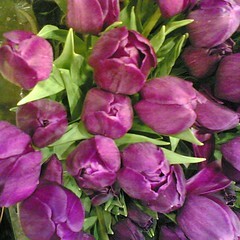 Yesterday at the grocery store, I saw big buckets of beautiful tulips on display, so I took some pictures with my phonecam. Is there anything quite as optimistic as tulips in January? I was very glad to see them. I love the beauty of the snow, but the nights are so long and the weather is so cold. But by January, the days are already getting longer, and spring is inevitable as long as the earth keeps turning. The tulips are a sign of hope, a sign that change is on its way, and that better weather lies ahead. Here is one last look at the pond. 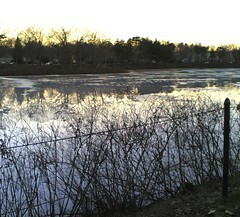 I took this photo with my phonecam on January 9th, during a warm spell. 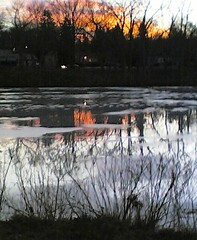 I was interested in the effect of the patches of ice and the reflections of trees and sunset on the water. Tonight I cropped this photo to get the composition I wanted. Here is another of my photos of Cummings Center during a January warm spell that had melted part of the ice. When I saw the pond, I started taking pictures, and kept going as the sun went down. 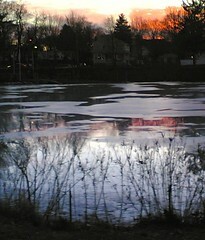 As the sun began to set, the red color of the sky was reflected in the water, making the white patches of ice more visible. This is another of the photos that I took on January 9th at the Cummings Center Pond during a warm spell a few weeks ago. Tonight I cropped the original photo to get this composition. I was interested in the interplay of the patterns of ice and the reflections in the water. I know that chain link fences aren't very lyrical, but I love the geometry of them. In this case, I thought the fence added a nice diagonal line as well as an additional texture. 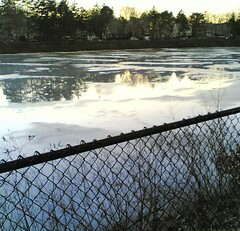 This time of year, there is usually too much ice and snow for much walking around the pond. But a few weeks ago, we had a bit of a warm spell. Here, north of Boston, if you get a warm spell in January, you had better take advantage of it. I took this photograph on January 9th during a walk at the Cummings Center Pond. The sun was almost setting and a walk at the pond sounded impractical. But I was very excited when I saw the pond! Some of the ice had melted, leaving patches of white ice which made a beautiful texture against the reflections in the water. It looked like a watercolor painting or a print! I started taking pictures with my phonecam and kept going as the sun was setting (which was only about fifteen minutes). Tonight I started editing the photos. This is one of the first photos that I took that day. Here is the painting I submitted to the juried show, as it looked on January 17th, the third day I worked on it and the submission deadline. That morning, I went up to the studio for a bit and added more dark tones to the trees and to the dark areas in the water, trying to get a bit closer to the colors of dusk that I liked in my photo which I was using as a reference. (I posted the photo here on September 23.) I also re-worked the tiny vertical marks, reflections of the trees on the water. I used very sparing amounts of paint so everything would dry, blending with my fingertips. Then I took this picture with my phonecam, and went home to submit my entry by e-mail. The show's theme is water. 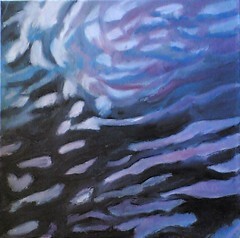 The application asked for a statement and here is what I said about the image: "This painting seems to sum up what fascinates me most about painting water: water's simultaneous movement and stillness; water's strict horizontality, its depth, and the hidden geometry of its waves; the way water reflects the sky and its surroundings, and yet remains itself." I am glad that I made the deadline, but of course I don't know if the painting will be accepted for the show. However, the show is (always) besides the point. The point of painting is painting. I really enjoyed painting this picture and am very happy that I did! This is an oil bar painting of a New Hampshire lake, based on a photo that I took this fall from the passenger seat of a moving car. (You can see the photo posted here on September 23.) This is how my painting looked on day 2, which was January 16th. I began with the goal of checking the angles of the waves in the water to try to make them all roughly parallel. (I used a T-square to check.) After that, I made some changes to the shapes of the dark areas in the water, using my photo as a reference. 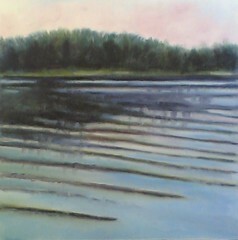 I also added some vertical marks to indicate reflections of the trees on the shore. I also added some light to the shoreline. I didn't do anything to the sky because I was happy with the way it turned out on the first day. When it was time stop for the day, I was feeling pretty optimistic that I would be able to submit the painting for a juried show, even though the deadline was the next day! (Oil bars dry faster than oil paint, but not THAT fast. This show allowed for submission of e-mail images and that was why I thought I would be able to make the entry deadline.) To be continued. . . . I started this is oil bar painting on January 15th, just as I was finishing up framing photos to be hung in New Hampshire later that day. But this painting is not for that show. 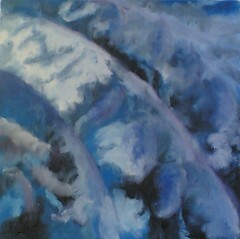 This is a painting for submission to a local juried show with the theme of water. I didn't think I would have time to get anything ready for it because I was busy with the mill and river paintings, and besides, the dates conflicted. But recently I found out that the submission date had been extended to the 17th of January. Time was very short, but I decided to start a painting and see what happened. The application form said images could be submitted by e-mail, which meant that the painting would not have to be dry by the deadline. So maybe it would be possible! It would be fun to try. I try to make art every day, so why not? I looked through my photos for ideas, and chose a photo that I took of a New Hampshire lake at dusk, posted here on September 23. I printed out the photo, took it to the studio, and got started. (I have had a lot of practice lately at working quickly. It isn't necessarily a bad thing. Painting quickly sometimes forces you to get directly to the point, and I have taken lots of drawing classes with timed drawings of one minute, five minutes, or ten. Sometimes you can get really good drawings that way.) So I used a gray oil bar to draw the composition in quickly, and then blocked in the main colors with oil bars, making sure to cover the canvas. At that point, it was time to pack up my paints, but I was happy with what I had done in a short time. I really love to paint, so I wasn't worried about whether or not the painting is done on time or is accepted into the show. To be continued. . . .
On January 8th, I took my seven oil bar paintings of the mill and river up to Manchester, New Hampshire, so they could be hung for display. All of those paintings were based on or inspired by photos that I took of Manchester this fall. After I saw the layout of the paintings in the space, I decided to also display the photos, in another part of the space. So the next day I got to work on printing and framing the photos. As I was working on that, I realized that all but one of the photos were posterized. The one that was not was the night view of the mill and river (posted here on October 1). I decided to see how it would look posterized, so I opened the image up in Painter IX. This is the result. I like both versions, but I think the posterized photo works better with the other photos, so I decided to use it. Now it is up in Manchester, with the other photos. 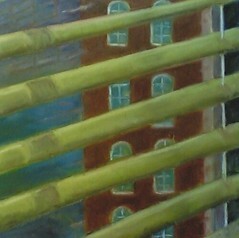 This painting is one of a series of views of the mill and river in Manchester, New Hampshire. This is how this painting looked on January 7th after I worked on it. I did a little cleaning up of the window blinds, and straightened out some lines. There was no time to do much more, and besides, I couldn't do much because the painting needed to be dry enough to take to New Hampshire the next day. (It was.) So this is also how it looks now, on display. The idea for the series (views of the mill and river) really came together for me with this image, looking out at mill buildings and river from inside a mill building. I have this painting hung so it is the first painting people will see, so I am glad I managed to get it ready in time. This is how this painting looked on January 7th, the day before I had to take it up to New Hampshire to be hung for the show. I couldn't make many changes because the paint needed to dry by the next day, but I added some shading to the trees and added more contrast to make the line of the little waterfall more visible. 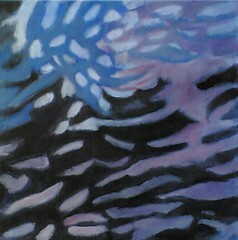 By January 6th, I had gotten a good start on the painting I posted yesterday, but I was still working on this one, too. I did a little revision that day, working on detail and trying to make sure the lines were straight. But I had to keep my changes because I wanted this to dry in a couple of days, in time to take it to New Hampshire. This is my painting of the Merrimac River as it looked after the second day that I worked on it, which was January 6th. I added more detail, building on what I had done the previous day. I worked quickly, using my photo as a reference. I was aware of trying to finish as much as I could, because the painting would need a couple of days to dry before being transported to New Hampshire on January 8th for a show. In this case, I think awareness of the deadline was helpful, forcing me to paint as directly as possible to get the essence of the image, but I was never aware of the time in a negative way, once I got to the studio. I was completely relaxed as I painted this image. 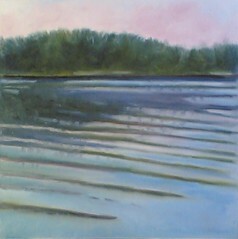 This oil bar painting of the Merrimac River is based on the photo that I posted yesterday. Here is how the painting looked after the first painting session, which was January 5th. I had the photo printed out for a reference, so I quickly drew in the composition, using a gray oil bar just like a big crayon. Then I put in the basic colors and shapes. Then I had to stop, but I was happy with what I was able to accomplish that day. To be continued. . . .
By January 5th, I was making good progress on the sixth painting for my show in New Hampshire, (a view of Manchester through a window in a mill building, posted yesterday). So, overcome by optimism, I decided to paint the seventh painting that I had planned for the series, the current of the Merrimac River near the small dam that appears in this photo. At that point, the water changes from calm to turbulent. I wanted to include that painting not only because the energy of rushing water powered the mills, but also so that image could provide a context for two of my paintings that look abstract but are close-up views of river current. I hoped that if I put in extra studio time and could get the painting done within two days, it might dry in time to deliver it to New Hampshire with the other paintings on the 8th. If not, I thought I could deliver it separately a few days later and still have it included in the show by the time it opens officially for public view the following week (the 15th). This was on January 5th, so in theory I had ten almost 10 days. I decided to try. The water was rushing, and so I could rush too! So on the morning of January 5th, I cropped this view from the photo I wanted to use and posterized the image in Painter. I took a copy of this image to the studio to use as a reference for my 7th painting. Tomorrow I will post the painting of this scene. . . . This is my oil bar painting as it looked at the end of the third painting session, which was January 5th. I brought along the printout with the digital overlay (see yesterday's post), and worked on applying in paint the changes I tried out digitally. 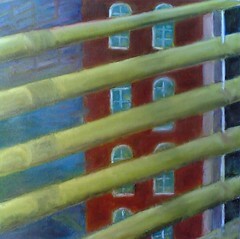 First, I changed the color of the building and the blinds. I used purple for the shading on the blinds, although it doesn't show as clearly as in the digital version because I blended the colors. I also decided to change the location of the shadow on the window with blinds, for the sake of the composition. Before returning the studio to continue working on this painting of the mills in Manchester, I decided to do a digital overlay to try out some color changes. I knew I wanted the building to have more red and purple tones. I was also searching for the right color for the window blinds that would be more subtle but would work with the surrounding colors. With the time pressure of the upcoming show, I thought that trying out the colors digitally would eliminate some trial and error on the canvas. Painting and re-painting is time-consuming in itself, but even worse, can wreak havoc with drying time. 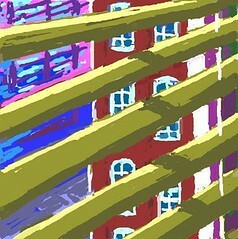 So I opened the image in Painter IX, and used digital pastel to change the colors of the building and the window blinds. By the time I finished the digital overlay, I had arrived at the colors in this image as a solution. I printed this image out and took it along to my next painting session in the studio. Here is my painting as it looked after the second painting session, which was January 4th. That day I went over all the main areas of the painting, straightening lines with a T-square, making the color more subdued, and adding definition and detail as I went along. For the most part, I was working with the oil bars and mixing the color right on the canvas. I usually begin by using a brush, but as I get more involved, I do a lot of blending with my hands, sometimes with paper towel and sometimes not, painting with the tips of my fingers. This means that I come home with paint on hands, clothes, and face. But as I recently said to my son, any day that I have paint on my face is a good day. This is how this painting looked after the first painting session (January 3rd). Earlier that day, I had made the digital sketch on my PDA (posted yesterday). Then I went to the studio to start the oil bar painting. 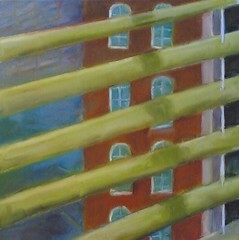 This is the view through a mill window in Manchester, New Hampshire, looking out at brick, windows, and river. I based this image on one of my posterized photos, as well as my digital sketch, and I took print-outs of both to the studio. My first goal was to lay out the composition, which I could do quickly because I had done the digital sketch. My second goal was to cover the whole canvas with paint. I was concerned about getting this painting done in time for an upcoming art show. Execution was less of a concern than drying time. Oil bars are oil paints in stick form. They dry faster than traditional oil paint, but not that fast! So my second goal for the first day was to cover the entire canvas with paint. Large areas would need more time to dry; modifying colors and adding details would take less paint and could be done later and still dry. The image posted here is really underpainting, rough because I was working quickly. But that day I left the studio satisfied with the composition, optimistic about finishing the painting in time, and relieved because this image is one of the first ideas I had for the show. 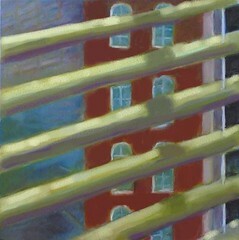 I am showing my oil bar paintings in Manchester, New Hampshire, images of the mills and the Merrimac River. My original plan was seven paintings and I expected to hang the show between the 15th and the 20th of January. A few weeks ago, the date to hang the paintings was moved up to January 8th. Since then, I have been worried about getting all seven paintings done by that date. (Three major snowstorms in the first two weeks of December did not help, either!) But over the winter holidays, I had more time to paint, and by January 3rd, I was a bit ahead of schedule with five paintings in pretty good shape. 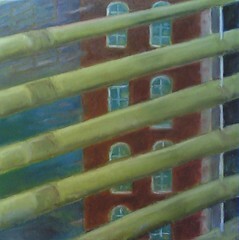 I was encouraged enough to start the sixth painting, a view from inside a mill building looking out, based on one of my posterized photos. I already had the photo for a reference, but decided to make a digital sketch, too. I wanted to work out the composition for a square format. Besides, the composition was complicated and it made sense to work out basic problems in a digital sketch before I started painting. So before heading to the studio, I made this little sketch on my PDA (handheld computer) with Pocket Artist. I was happy with it, so I transferred the image to the computer and took a print-out to the studio, along with a print-out of the posterized photo). Making a digital sketch really helped me to figure out issues like placement of windows in relation to window blinds, etc., so that later that day in the studio, I was able to quickly establish the composition on canvas. I like the energy of my rough little sketch, and it inspired me to keep going and finish all seven paintings by January 8th (which I did!). Tonight I wanted to post the PDA sketch here, but it was really rough around the edges, quite literally, so I opened the image in Painter and used digital pastel to extend the drawing to the edge of the (digital) page and do just enough basic cleanup to make it presentable. So here it is. On January 3rd, I returned to the studio to work on this oil bar painting of the current in the Merrimac River, based on a photo that I took earlier this year in Manchester, New Hampshire. On the previous day's painting, I stopped working on this painting because I felt that I was losing both the shapes and luminosity that were there on the first day, so I also brought a photo of a previous version of the painting. I used that photo as a guide to restore some of the shapes and light that I had lost. 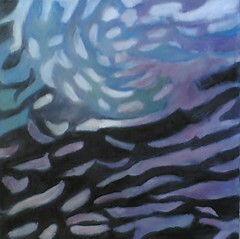 I also added definition and color to the painting, adding more purple tones to the dark areas. When it was time to pack up and go home for the day, I was much happier with this painting than I had been the day before. On January 2nd, while I was working on newer paintings, I also took a few minutes to straighten out the railings on the bridge, because I had noticed that the the top railing wasn't straight. So I took another look at all of them. It is hard to get a straight line with oil bars, even though I use a T-square with the brush or the oil bar stick. 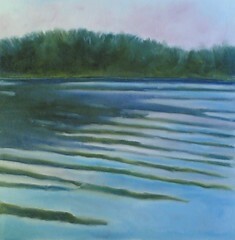 This is another painting of the current of the Merrimac River that I am working on. This is how it looked on the third day I worked on it, which was January 2. 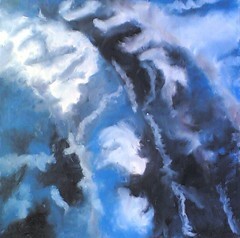 (I have been working on both paintings of the river current.) My intention that day was to block in stronger colors and define the shapes in this painting, using my photo as a reference. But when I got to this point, I was not happy with the way this was going. I felt that I was losing the definition of the shapes, and was also losing the luminosity of the image. I decided to stop work on this painting for that day. My plan was to return to the studio the next day with a copy of the photo I took of this painting on Day 2, and try to recover what I felt I had lost. This is a painting in progress, based on the photo I posted yesterday. 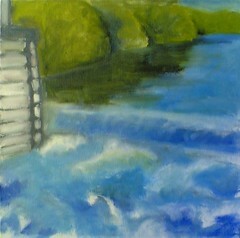 I am using oil bars to paint the current of the Merrimac River, near a little dam near Manchester, New Hampshire. This is how the painting looked after the second day's painting (January 2). It is getting harder to keep track, because at this point, I am working on three paintings at once, trying to get them all ready for a show to be hung next week. Anyway, this version shows the correction I made in the perspective. I made the pattern of the swirls in the water more consistent with a more horizontal plane, from the viewpoint of looking across and down at the river from the shore (as in the photo). You can see some purple lines in the painting that I put there to guide me as I work, because it is easy to get lost in a painting like this. The lines won't show in the finished painting, because I will blend the purple in more. But at this point, the lines are helpful as I figure out the movement of the current, and the placement of light and shadow in the painting. This is a posterized version of a photo that I took in September in Manchester, New Hampshire. 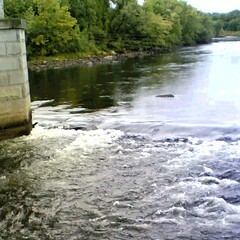 This is a close-up view of the Merrimac River, near the mill area. 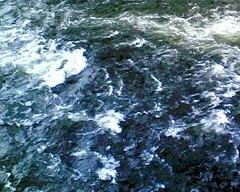 The water is swirling because this photo was taken near the little weir (dam or waterfall). This photo is also the starting point for the painting in progress that I posted yesterday. Apparently I had never posted this photo before, so I decided to post it tonight. 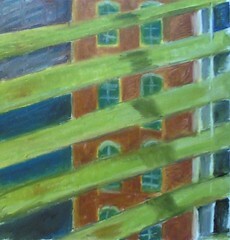 Here is another oil bar painting that I am working on. I started it three days ago, and this is how it looked after I had finished working on it that first day. Like the painting I posted yesterday, this is also a close-up view of the Merrimac River current, again based on photos I took up in Manchester, New Hampshire. (Although I thought I had already posted the photo that this painting is based on, apparently I didn't, so I will do that tomorrow.) Like the painting I posted yesterday, this looks like an abstraction, but is really based on observation of the swirling waters of the Merrimac river near the "weir" or small dam. I am working on these two paintings of the river current at the same time, to maintain similarities of scale and approach. But it also makes sense given the time pressure, because these are for a show in January, paintings of the the Merrimac River and the mills in Manchester, New Hampshire. On the day that I started this painting, I had a print-out of the photo for reference, and just blocked in some of the basic shapes and colors, and this is as far as I got. Even though the perspective needs adjusting in this view, by the end of the painting session, I began to get the feeling of the swirling river current, as my hands made repeated swirling in the paint to mimic the movement of the water. To be continued. 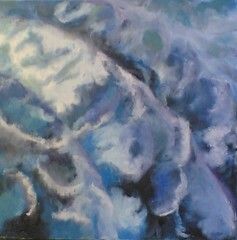 . .
Two days ago, I went to the studio and worked on this painting that I had roughed in the day before. 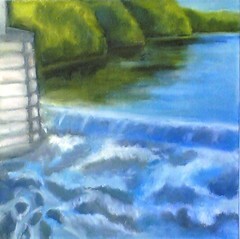 This is based on a photo I had taken up in Manchester, New Hampshire, a close-up view of the Merrimac River. I used the photograph as a reference while I painting, paying attention to the shape and placement of the shapes I see in the water. I decided to focus on identifying the darkest and lightest shapes because the patterns of light and shadow will communicate the movement of the river current.